I absolutely love Thanksgiving — and if I’m going to be honest, it certainly has loads to do with all the delicious food on offer on this special holiday. Turkey, of course, is the main star. I rarely eat turkey, and so when Thanksgiving comes around I very much look forward to digging into a juicy slice, smothered in gravy and cranberry sauce. But one thing we might all look a little less forward to is the challenge of carving that huge bird. 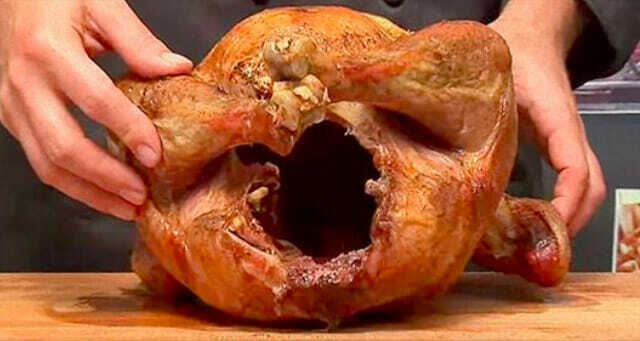 Don’t fret though — take a look at this chef’s incredibly simple way to carve a turkey. I guarantee you’ll never do it the way you used to again. The first major rule, according to Chef Mark — don’t carve at the dinner table. This is the first mistake most of us make. There’s simply not enough room to do a very good job at the table — and not to mention the pressure with all eyes on you! Simply do it from the privacy of your kitchen instead. Now you can move on to step one: remove the bird’s legs. Then once you’ve done this, cut the breasts away from the rest, with one clean slice along the keel bone. A very sharp knife is key! This is non-negotiable. Once you’ve lifted your breasts off, cut against the meat’s grain to create beautiful individual portions. After slicing them all up, place the pieces together on a large presentation platter, and tada — your juicy, tender turkey is ready to serve! Carve your turkey this way and you’ll be sure earn a “master turkey carver” title! Watch the video below for Chef Mark’s full instructions. Share this easy technique with your family and friends to give them valuable insight on how to properly carve a turkey — and Happy Thanksgiving everyone! May loads of blessings come your way.